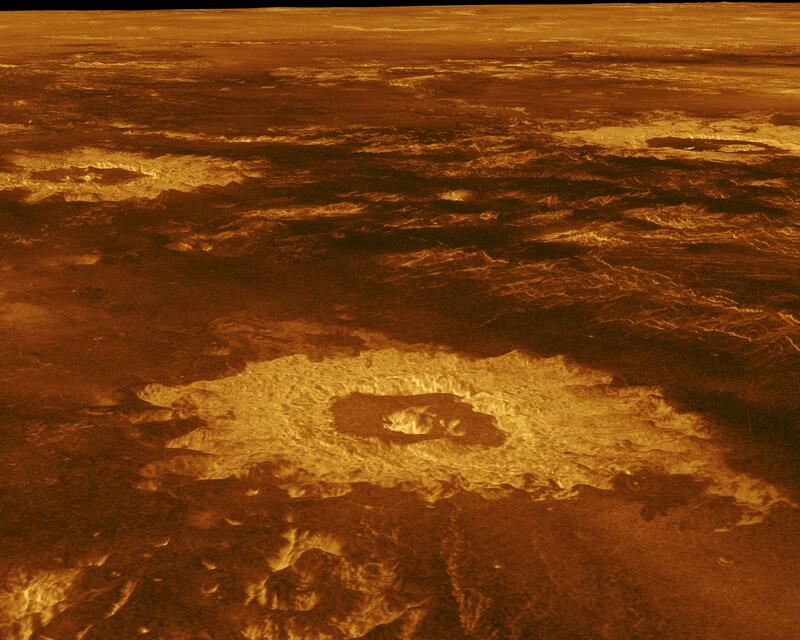 Three impact craters are displayed in this three-dimensional perspective view of the surface of Venus. The center of the image is located at approximately 27 degrees south latitude, 339 degrees east longitude in the northwestern portion of Lavinia Planitia. 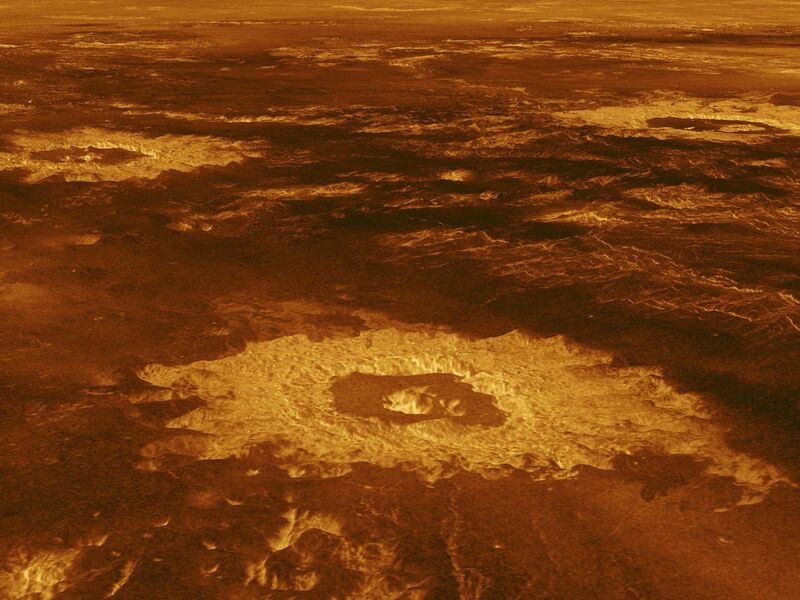 The viewpoint is located southwest of Howe Crater, which appears centered in the lower portion of the image. Howe is a crater with a diameter of 37.3 kilometers (23.1 miles) located at 28.6 degrees south latitude, 337.1 degrees east longitude. Danilova, a crater with a diameter of 47.6 kilometers (29.5 miles), located at 26.35 degrees south latitude, 337.25 degrees east longitude, appears above and to the left of Howe in the image. Aglaonice, a crater with a diameter of 62.7 kilometers (38.9 miles), located at 26.5 degrees south latitude, 340 degrees east longitude, is shown to the right of Danilova. Magellan synthetic aperture radar data is combined with radar altimetry to develop a three-dimensional map of the surface. Rays cast in a computer intersect the surface to create a three-dimensional perspective view. Simulated color and a digital elevation map developed by the U.S. Geological Survey are used to enhance small-scale structure. The simulated hues are based on color images recorded by the Soviet Venera 13 and 14 spacecraft. 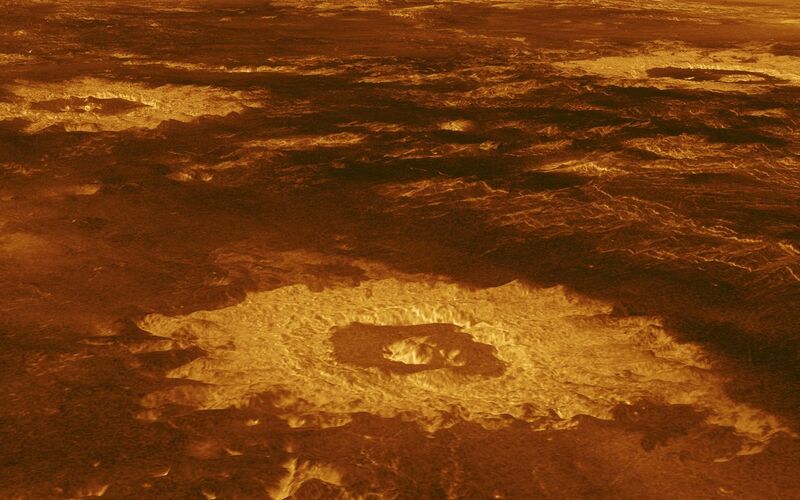 The image was produced at the JPL Multimission Image Processing Laboratory and is a single frame from a video released at the May 29, 1991, JPL news conference.